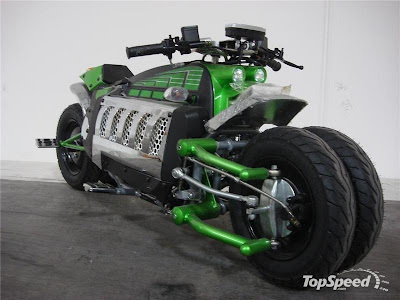 The Dodge Tomahawk was made some time ago by a few geniuses in the Dodge company that said “hey lets put a Viper engine in a Motorcycle”. However the 10 cylinder engine is much to heavy and creates balance issues for just 2 wheels so a new platform was made for the cycle. That gave us the Tomahawk as we see it today. Skip forward a few years, Rip off artist in China have made a scooter that uses the same kind of platform that the tomahawk uses, except 1/3 the size. Now at first I admit that I wanted one, I saw one in fact going down the road in Itaewon next to the base, it parked by a shoes shop and I managed to get a few pictures of it. After close inspection I saw some huge Flaws in its design. 1. 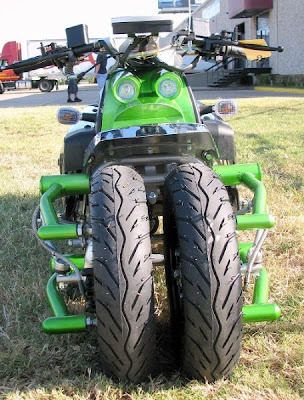 The shocks on the front are the same quality that you might find on a Wal-Mart Bike. That means when the shocks break, you Tomahawk scooter is going to drop to the pavement and or flip end over end if you at a high enough speed. 2. I saw some defects in the Welds, im not even a good welder but I know a rush job when I see one. 3. Plastic body panels which seem to break effortlessly. Good points I saw were few but. I would say If you bought one of these, consider souping it up, Take it apart, Reinforce the frame, Make way for Bigger higher quality Shocks, and take off those ridiculous plastic panels and just rock it with the engine showing.